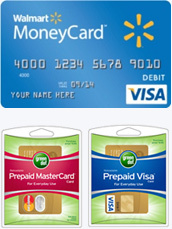 A Green Dot® Prepaid MasterCard® or Visa® Card can be purchased at most retail stores. The card must be activated at the register. There is a $4.95 fee to activate the card. Once you have purchased the card, it must be registered. You can register your card by calling the 800 number on the back of the card or by going to the Green Dot® website. The following information is required to register the card: Name, Address, Date of Birth, Social Security Number, and Phone Number. Once your card is registered, it is ready to be used. You will receive a permanent card with your name on it in the mail within seven to ten business days. Your Green Dot® Prepaid MasterCard® or Visa® Card can be reloaded at a local retailer or through an online reload from your bank for a $4.95 fee. The Card can also be reloaded via direct deposit for no fee. There is a monthly service fee of $5.95.